If you attended Floriade this year (and according to Andrew Barr you most certainly did!) you might have noticed a number of deluxe children’s cubby houses on display. Well, on the very last day of the festival of flowers, Independent Property Group auctioned and raffled the 4 custom-built pintsized dwellings and in doing so raised a staggering $41,500. In addition, over $3000 was raised from a raffle, meaning around $45,000 was raised all up! Today, the proceeds of the charitable initiative were awarded to the Centenary Hospital for Women and Children and Boundless Canberra. 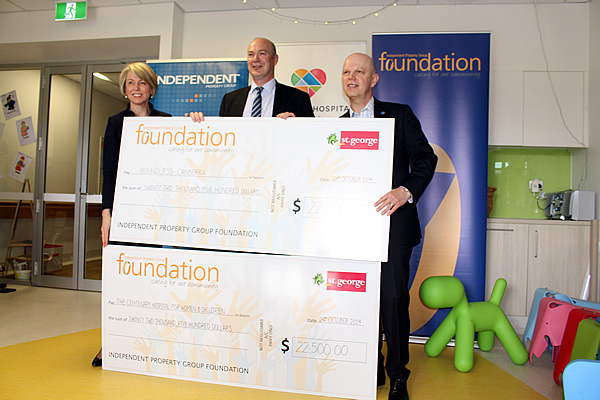 CEO of the Independent Property Group John Runko presented the cheques each for $22,500 at a presentation held in the paediatrics playroom of Woden Hospital. Chair of the Canberra Hospital Foundation Deb Rolfe, spoke eloquently of the great impact the donation will have on families and their children, and accepted the cheque on behalf of the Centenary Hospital for Women and Children. With a grin from ear to ear, a gracious and glad Bruce Papps accepted the cheque for Boundless Canberra – a charity dedicated to building Canberra’s first fully inclusive playground on the shores of Lake Burley Griffin. This was a truly inspired and inspiring initiative from one of Canberra’s good corporate citizens. Let’s see more of it I say. Well done and congratulations to Canberra’s Independent Property Group!